Now that I'm getting to know the limits of my system I've decided that any galaxy below Mag.10 deserves a serious attempt at imaging. With this in mind I decided to have a try at NGC 4725 which is rated at Mag.9.20. Unfortunately the sky soon deteriorated and I was only able to obtain 5 subs that were worth using with a couple of these being affected by a bit of haziness. Although the resulting image isn't great it shows that it is a target worthy of another try on a better evening. 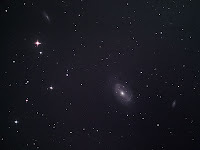 The other two obvious galaxies are NGC 4747 & NGC 4712. Details: f.4.3 Newt. 5x 7minute exposures @ iso800 with CLS in DSS & CS2.